In January of 2015, three great saints of our Church are celebrated on Sundays: St. Theodosius of Palestine, head of monasteries (January 11); Ss. Athanasius and Cyril of Alexandria (January 18); and St. Gregory the Theologian (January 25). 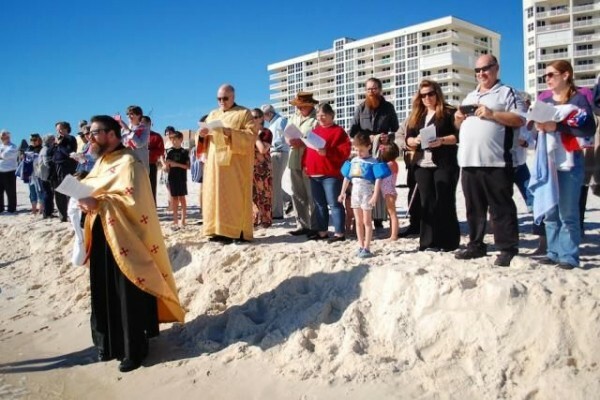 St. Andrew Antiochian Orthodox Christian Church of Pensacola, Florida offers the Outdoor Great Sanctification of Water and “Cross Dive” at Theophany celebrations in 2014. The liturgical texts for the month of January, blessed by His Eminence Metropolitan Joseph, are now ready for clergy and laity to download from the Online Liturgical Guide. With these words from the Service of the Great Sanctification of Water, the Orthodox Church transitions from the Nativity of our Lord, God and Savior Jesus Christ (Christmas) to His Epiphany, or Theophany. In this great feast, we celebrate the revelation of our Lord as God. Theophany is also known as the “Feast of Lights” in that Jesus, by His baptism in the River Jordan, enlightened the world. Christ’s baptism also marks the renewal of humanity: our Lord is cleansed and He shows us how we must be cleansed of sin by drowning it in the waters which He blessed by entering them. The hymnography and prayers contained in the liturgical texts mark all of these themes for the feast on January 6. Theophany is one of three feasts (along with Pascha and the Nativity) in which the Orthodox Church celebrates the Royal, or Great, Hours and the Vesperal Divine Liturgy of St. Basil the Great on the eve, marking its solemnity and importance. Many Orthodox Churches offer two services of the Great Sanctification of Water on Theophany: indoors, where the faithful can drink the water and take it home; and outdoors at a stream, river, lake or ocean. The Sundays before and after Theophany, January 4 and 11, mark one continuous celebration of this great feast.